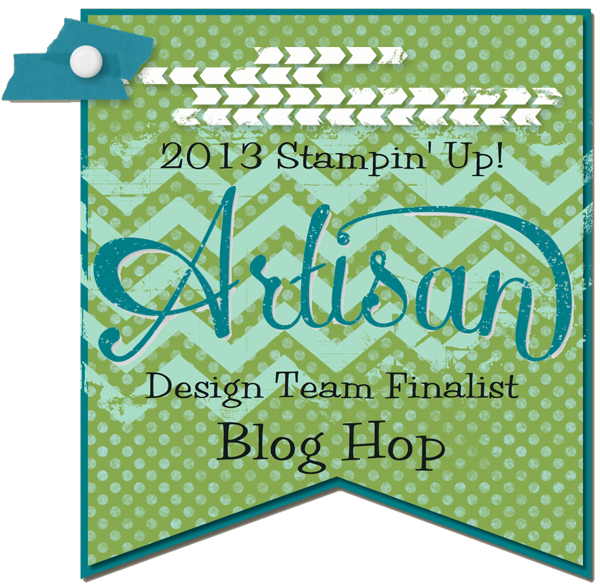 Welcome to Day 7 of the 2013 Artisan Design Team Finalists Blog Hop! I can’t believe it is Day 7 already! This has been so much fun! I sure hope you have been enjoying the finalist’s projects, I think they have all been AH-mazing! It is so different to get to enjoy them up close and personal and not be competing with 5000 other excited stampers to see the boards! I love convention but I am getting so much more out of these fabulous creations at home on my own computer screen! This is my fluffy, romantic confection of a card! It features lots of sewing and sponging and pretty 🙂 I used two of my absolute favorite stamp sets that retired with the new catalog: Established Elegance and French Foliage. I probably used the script from French Foliage on nearly every project I made while it was current! Well maybe not every project but lots and lots of them! Highlights of this card: I lightly stamped some Very Vanilla Cardstock with the Netting Stamp and the script from French Foliage. Then I cut out it out with a framelit from Apothecary Accents. I took that piece of paper and cut it down the middle longwise and that created the top and bottom piece of the card. I stacked that with half of a doily and attached them both to the front of the card with machine stitching. I also stitched together two different patterns of the Two for Tea DSP for the front. I cut a piece of First Edition DSP (another sad, sad retirement loss) with an oval framelit. I colored a small butterfly image from Papillon Potpourri with markers and stamped it on the top center of the First Edition and again on a piece of Very Vanilla. I punched out the image on the Very Vanilla and popped it up over the image on the DSP. 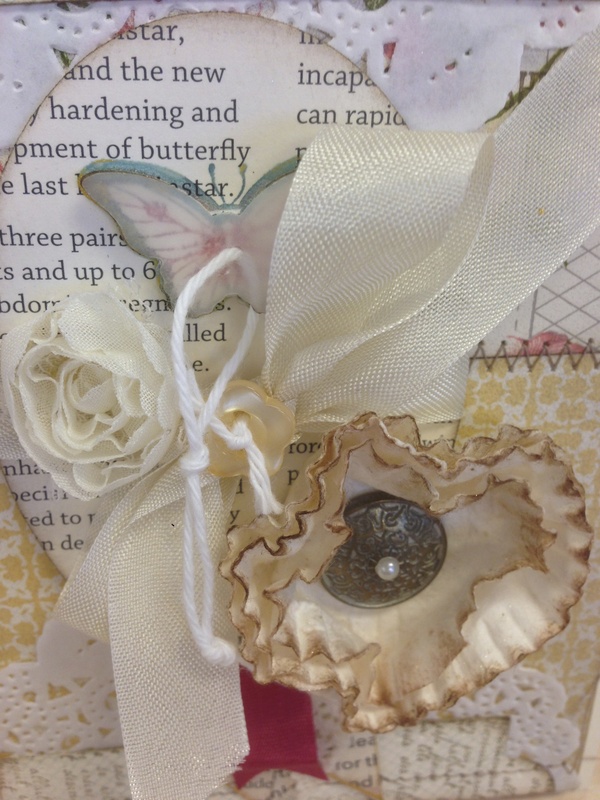 Then I punched another butterfly out of vellum and added that and a pearl on top of the stamped butterfly. Lots of pretty dimension! 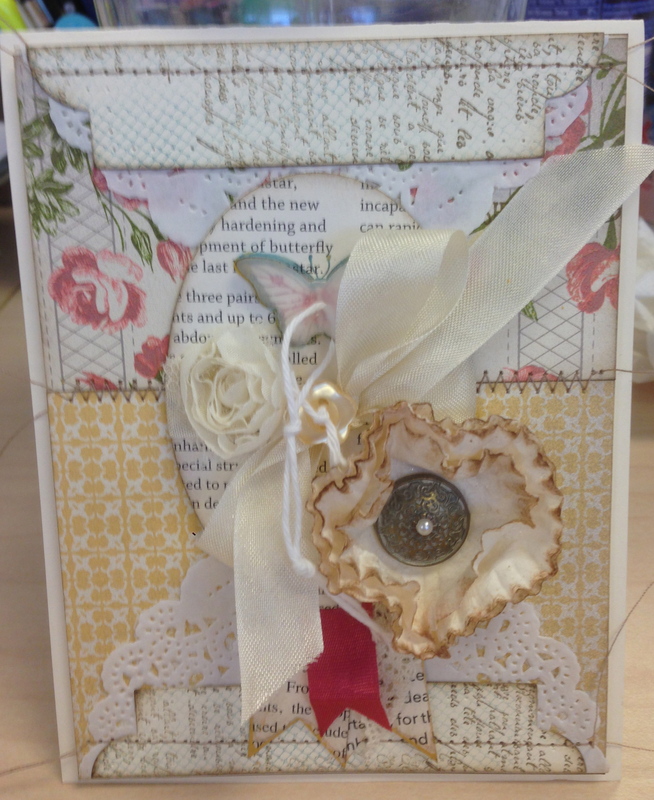 I added a button, pennants, flower trim and a big flower made from the cupcake papers in the Pop-Up Posies Designer Kit. One of the ribbons I used came from the Artisan Embellishments Kit in the Spring Mini….oh.my.word….I just loved that kit and could not get enough of it!!!! All the vintage-y, flowery, lacy yumminess just makes me feel good! I hope it makes you feel good too and inspires you to make something pretty today! This entry was posted in 2013 Artisan Design Team Finalist, Artisan Embellishments Kit, Big Shot, Cards, Framelits Dies, Stampin' Up, Techniques, Vintage by kate80132. Bookmark the permalink. This is so sweet and pretty, Cathy! I love all of the stitching and sponging. I really miss that flower trim. So, so pretty!!! All of the sponging gives this such a romantic touch….feelin’ the love! Holy Smokes! This card is my very most favorite of card of yours yet, and I have loved all of them. It is absolutely stunning. Love, love, love!! !